Here’s the brochure for EU Leavers’ Day. The typography was subconsciously inspired by The Designers Republic. 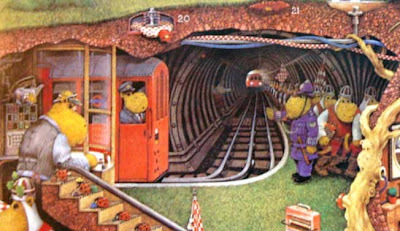 The retro-tech tubular contraption is a drawing of Kennington station in the London underground. It’s from some guy who has collected stacks of railway maps (helped by this guy). These London railway schematics became an institution during the Second World War; with my discovery of them it dawns on me that they provided inspiration for Peter Cross’s Deep Down.